This week I sent part of my novel in to be edited. What was picked up was the improvement in my dialogue. The novel is a gritty police procedural, which is set on a fictional estate in Nottingham. In the piece the characters speak in colloquial vernacular, (slang). I must admit that a lot of my characters swear. This is because I believe that dialogue should sound authentic. The way a character speaks should be appropriate to that character. My novel is about drug dealers, readers wouldn’t believe a drug dealer who said ‘Oh dear,’ they expect such rough and ready characters to use bad language. I try to keep my dialogue short. People don’t usually speak in long sentences, so why would my characters. What people usually do is add a few ums and urrghs to their conversations, but writing dialogue the way people literally speak would quickly become irritating to the person reading it, so I tend to leave out the awkward pauses, and write my dialogue as realistically as possible, without making my characters irksome. I have stopped using so many dialogue tags, (he said, she said). Since I’ve learnt about beats I find my dialogue sounds a lot more realistic with some action interspersed between speakers. One of the things I was commended on was that none of my characters call another character ‘Duck’. A lot of people associate Nottingham people with the word duck. Saying ey up me duck instead of hello, and calling people duck, which is, according to the Left Lion, a term of endearment. I only call people duck when I’m in a different Town or City, then I tend to broaden my accent. I know very few Nottingham people who use it, (although they do say ey up), so I didn’t want my characters to use it. According to my editing class, to use the term would have been lazy as it’s stereotypical Nottingham talk. Although my dialogue is getting a lot better, it’s still not perfect. One of the things I was picked up on was question marks. I had left the question mark off a piece of speech, because although it was a question, the character already knew what the answer was going to be, so she was really being sarcastic. This lead to a discussion on when is a question not a question. Apparently they don’t use question marks in Italy. A lot of the editors thought that I was wrong to leave off the question mark, and in the end I agreed with them. I have to consider the rule of the genre, and whether the readers would expect it. I think they would. Donny Ray knows things about Christopher—things he couldn’t have possibly learned at Loveland. As the psychologist delves deeper into the mysterious patient’s case, Christopher’s life whirls out of control. The contours of his mind are rapidly losing shape, and his grasp on reality is slipping even faster. Is he going mad, or is that what Donny Ray wants him to think? In this taut psychological thriller from Andrew E. Kaufman, bestselling author of The Lion, the Lamb, the Hunted, a tormented man must face his fear and enter the mind of a killer to find the truth…even if it costs him his sanity. Twisted is an utterly absorbing book which kept me hooked from the very first page right through to the excellent ending. I don’t want to give too much of the story away because I don’t want to spoil a great read. Dr Christopher Kellan, a psychologist at Loveland psychiatric hospital recognises his latest patient. Donny Ray Smith is due to stand trial for the murder of a six year old child, but he soon realises that the enigmatic Donny Ray knows more about him than he should. On a tight deadline to evaluate Donny Ray’s mental state, Dr Kellan begins to lose his grasp on reality. The reader is taken through a whirlpool of emotions as we take the journey with him, and what a journey it is: shocking, mystifying, mind blowing, but ultimately compelling. Twisted is the ideal title for this book, because there are so many twists and turns that lead to a superb ending that I never saw coming. I thoroughly enjoyed this book, and will definitely be reading more by Mr Kaufman. I have no problem recommending this novel. A brilliant 5* read. Ever since the birth of their daughters four years ago, two couples, Josh and Hannah, and Dan and Sasha have been best friends. They spend so much time in each other’s company that the two young girls have grown up more like sisters than friends. Then one day Dan drops a bombshell, he is leaving Sasha. Josh and Hannah agree to be neutral, and support both couples during this difficult time, but things soon take a downwards curve, when the emotionally unstable Sasha refuses to accept the situation. Bad things start to happen, Dan and Sasha blame each other, Josh and Hannah are torn between the two. When bad things start to happen to them, just who should Josh and Hannah believe. This is a fantastic book. Cohen takes you on a ride that you don’t want to get off. The situation is all too real, one couple caught in the middle of the breakup of their best friends marriage. The ‘perfect’ couple splitting up, whilst the relationship of the less than perfect couple is sound, or is it? It was chilling witnessing the sophisticated Sasha fall apart. My sympathies went from one character to another at an alarming rate, until I wasn’t sure what, or who, to believe. There is also the memoir of a young girl dotted throughout the story, that adds a mysterious undercurrent to the already dark plot. The pace was fast. It was definitely a CPID, (couldn’t put it down), book. I was definitely not expecting the ending, it was a complete shock. 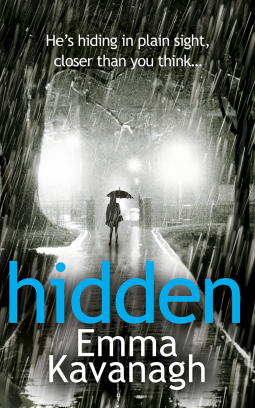 This is a fabulous psychological thriller that left me wanting to read more by the talented Ms Cohen, I’m sure you will feel the same. A definite 5* read. I thoroughly recommend it. A gunman is stalking the wards of a local hospital. He's unidentified and dangerous, and has to be located. Urgently. Police Firearms Officer Aden McCarthy is tasked with tracking him down. Still troubled by the shooting of a schoolboy, Aden is determined to make amends by finding the gunman - before it's too late. To psychologist Imogen, hospital should be a place of healing and safety - both for her, and her young niece who's been recently admitted. She's heard about the gunman, but he has little to do with her. Or has he? This book starts at the end, which is quite a fresh approach, and something that I feel works well, because you want to read on to find out what has happened, (You don’t find out who the shooter is until the actual end of the novel). It starts with Charlie, a journalist, witnessing a mass shooting at a the local Mount Pleasant hospital. The story is very effectively told over six days, from the perspective of the four main characters: Charlie, a journalist with the local paper, Aden, a firearms officer, Imogen, a psychologist, and the shooter. Don’t let that put you off. It is a very easy book to read. There are quite a few sub plots involving these characters, Imogen the copper red haired twin, who is desperate to have a baby, Charlie, who’s friend has died mysteriously, and Aden troubled by the shooting of a schoolboy. The plot is very clever, and quite gripping. I liked the way that somehow the characters lives are all intertwined. Charlie is a little bit of a stereotypical journalist, but I did become fond of her. This was a couldn’t put down novel, because I had to know what why there was a shooter stalking the hospital, and why did he open fire. There were plenty of red herrings to misdirect me and I didn’t guess the ending. I thoroughly enjoyed this novel, and would highly recommend it. On the 31st January I finally sent my manuscript off to the Debut Daggers. Three perfect chapters and a synopsis, well, as perfect as I could make them. The Debut Daggers is run by the Crime Writers Association (CWA), and is open to anyone who has not had a novel published commercially. Like me. All shortlisted entries receive a professional assessment of their work. The winning entry will be seen by leading agents and top editors. So I'm keeping my fingers crossed. The Long list will be announced AFTER they have announced the shortlist on 15th May at CRIMEFEST, it seems such a long way off, but it's only just over a month away. Talking about CRIMEFEST, It's your chance to meet, and mingle with authors, agents and publishers, and have a great time. There are some fabulous authors attending this year. Some of the highlights are: Maj Sjöwall being interviewed by Lee Child, and Sophie Hannah & Mathew Prichard celebrating 125 years of Agatha Christie. The Full CRIMEFEST Pass is currently £135 but will incrementally go up to £175. The full pass includes admission to all panels and a CRIMEFEST delegate bag with books and a programme. Day passes are also available. I blog about fiction, the writing process, book reviews, and hopefully a few interviews with my fav authors. I will talk about my work in progress, I may include some excerpts. I will also add the occasional short story, and even the occasional poem. Feel free to have a nosy around the site. I would be grateful if you would leave a comment or two.